Prahlad Kakkar who ran this place for a few years once said “Tea makes you go in the morning and come at night”. 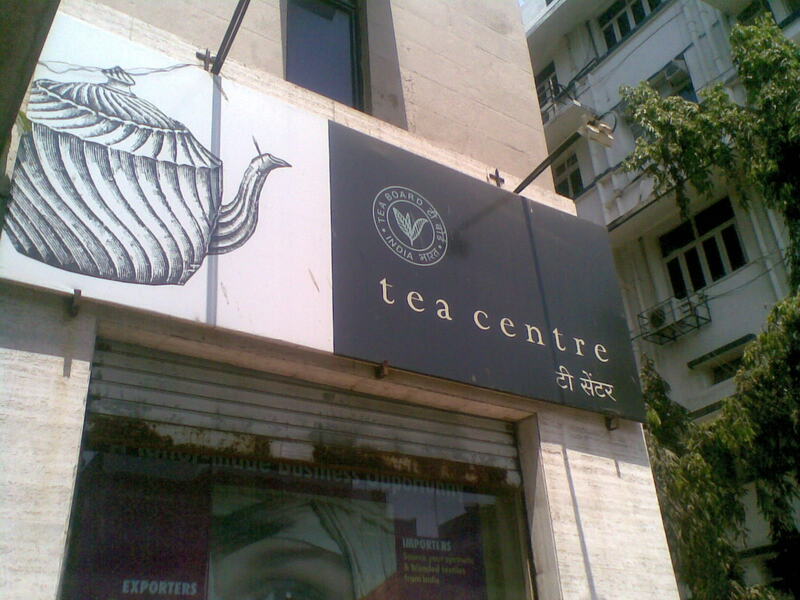 The tea Centre has subsequently been run by Rathikant Basu (yes the bureaucrat turned, Star honcho, turned and humbled by his own channels Tara fame).Honestly I went to the place after reading Kalyan Karmakar’s blog (in this case blogs on the place). I have been in and around Chuchgate for nearly three decades, did a recce once, never sat down to eat there. This time we did. 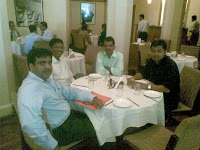 It is not much of a salesman eating out kind of place, there are hundred others around Nariman Point. However, it may have been one, since a salesperson was a pretty high once in the value chain. It was started in 1956, by the Tea board. One of the objectives of the Tea board was , to popularize the consumption of tea in popular or populist settings. 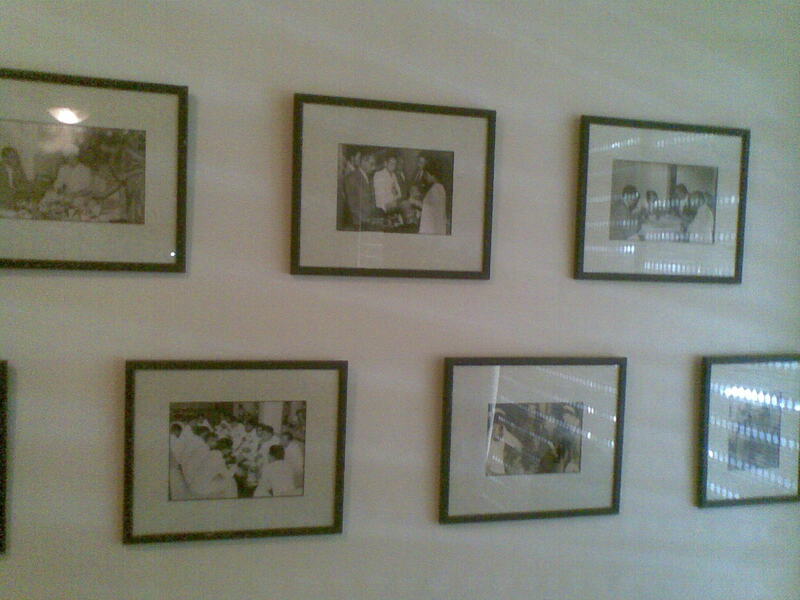 Delhi had the Tea board restaurant on Jan path, which was run by a grand Uncle of mine. It certainly, feels grand, yes Kalyan, a little like Calcutta club or at least a private club. New York has The Russian Tea Room. 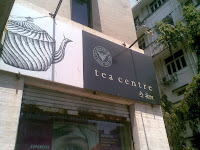 Mumbai, at Church gate, beside the Stadium restaurant in Resham Bhawan has the Tea centre. This is large restaurant with crisp white covers and beige sofas (the ones with arms), maroon serviettes and air conditioning that’s below 20. Adjoining is a party room and a small tea store where I bought a bergamot flavored earl grey tea and a very cute round strainer. Now the food, well I never do the blunder, but we did this time, we ordered the executive continental lunches, which promised. Grilled fish, Pimento Rice, Jacket Potatoes, Coriander Sauce Vegetables and Desert. Similar stuff for the vegetarians minus the fish. We thought it will be fast and the process of ordering quick. It turned out exactly the opposite, people around us got their food and we drank iced tea and twiddled our thumbs for 40 minutes. 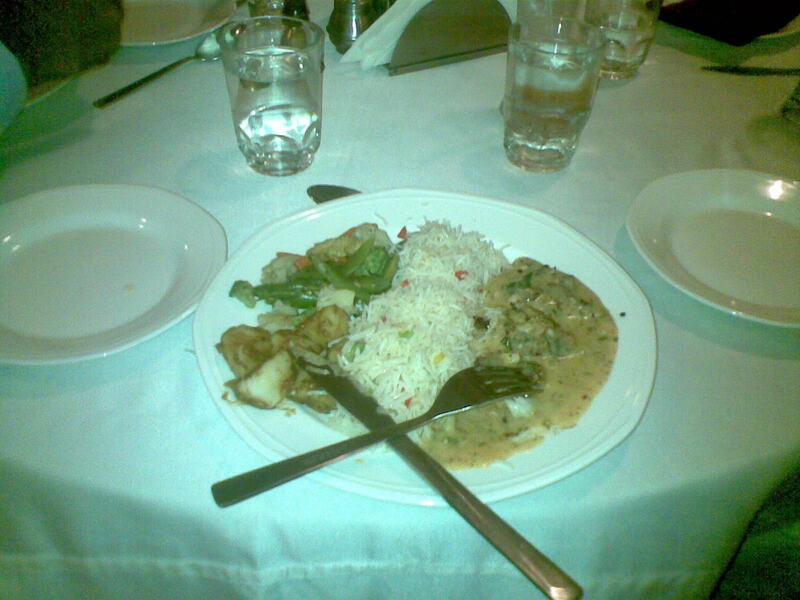 Enter the Executive Continental lunched, the vegetarians looked disappointed, The Non vegetarians equally disappointed, the grilled fish was in a mustard kind of sauce, the potatoes were boiled and smeared with brown gravy, the rice a vegetarian pulao,. The Desert an apology of a strawberry soufflé. Overa ll a mediocre experience at an illustrious place. Maybe it was what we ordered, the perils of a food taster. 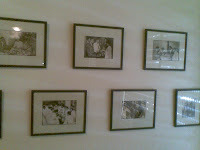 The maths, about Rs 1500/ for the six of us for lunch a feeble dessert and teas for all-The quirky stuff on the menu and the walls like a “ a teapot is neck deep in hot water but still manages to sing” are really funny. It’s a great a place for a middle aged manager to bring out the secretaries in his office for tea and pakoras. Its rather harsh, but actually some stuff like this was happening. The current lease holder is Cyrrus Chenoy, The new manager was Vispy a crisp middle aged man on his second day at work (his last job was at RTI, that’s another food story, I mean RT I). Around us everyone seemed appreciative and cool, For me it was a promised paradise lost. 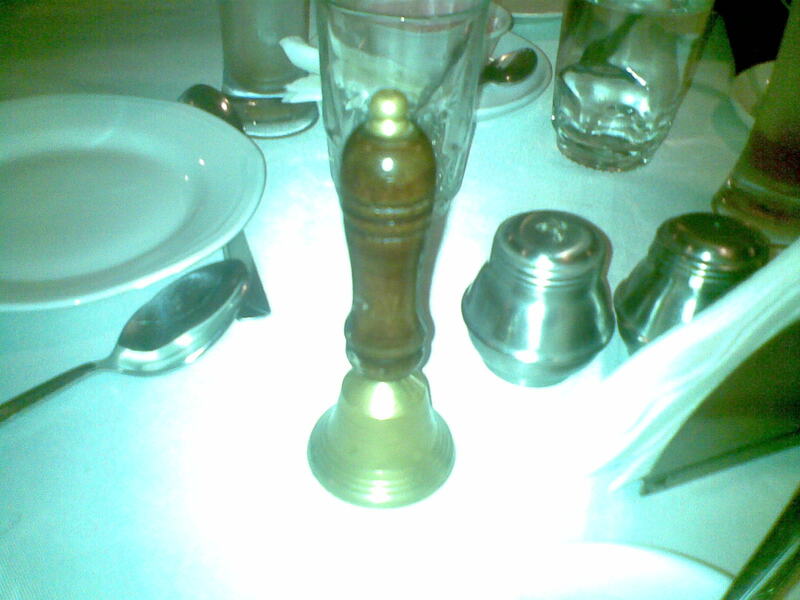 Though out of line in most places, here there are tiny bells to draw attention to your table. I was a Tea centre this afternoon. Vispy's 4th day! My Mama and Masi in Law were meeting up there. So I crossed JJ and joined them. Mama's favourite chatpata bhindi w/o the chatpata sauce. Mama and masi had veg dhansak. I had chicken dhansak. The onion was over caramelised and my Parsi in laws were quick to spot the bitter taste. 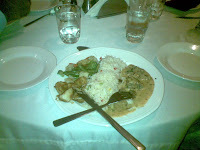 The chicken was pretty good but they found the veg dhansak to be too bland. We finished it off with a plate of scones which was nice. Thanks for mentioning me. It's Kar'makar' though. Then the management shifted to Indian Summer. Tea Centre is still different though not as quaint and magical as it was used to be. Great to see your blog Sam! Let get back in touch. Big man, Thanks. Will connect up. this one is an unusual write up Samil Bhaiya.. particularly the spicey closing ;-).. good one ! !